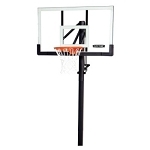 Sometimes the choice of basketball hoops for your home basketball court can be overwhelming. To assist you inch navigating the many choices available, the list below will provide you some steps to differentiate different manufacturers of basketball systems and different features available within those manufacturers. The best way to navigate the earliest part of choosing a basketball hoop outdoor system is to recognize what manufacturer will best fit your budget. Outdoor basketball systems can start out as cheap as $150, but can also go as expensive as several thousand dollars. So, knowing your budget is the best place to start out as that will direct you the appropriate manufacturer(s) within your budget. For instance, if your budget is less that $800, then your target makers will be Lifetime basketball and Spalding basketball. Note that Spalding basketball and Huffy basketball are the same company. 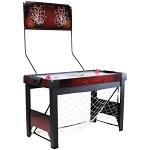 If your budget is over $800, you will be looking at Mammoth basketball, Goalsetter basketball, Goalrilla basketball, and Spalding basketball - inch particular, their Arena View basketball line. Within each manufacturer, you will also have budgets for different features. For lower-end budgets - those cheaper than $800 - you will have several options for backboard material: glass, acrylic, polycarbonate, and plastic. For those basketball hoops outdoor systems more expensive than $800 have either glass or acrylic options. Makers of basketball hoops for the lower end budget are Huffy, Spalding, and Lifetime. Those for the higher-end budgets include Goalrilla, Goalsetter, Arena View, and Mammoth basketball options. Diving a little deeper, you will want to take note of different basketball goal system feature within each backboard type and budget. In the lower end of basketball systems, you will see several different basketball hoop design options. 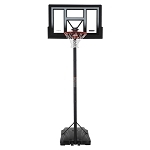 For instance, most every basketball system inch the lower end is able to adjust the backboard up and down inch height. Those lift mechanisms differ between manufacturers. For instance, Lifetime Products has several lift options, most of which use a squeeze handle to adjust the height. Many consider the squeeze handle option a much easier design to use than any other design. Inside the squeeze-handle design from Lifetime Products, Lifetime make two options: the Power Lift and the Action Grip. The Power Lift uses a pneumatic design to raise and lower the backboard, and is typically found on their basketball systems that have a glass, acrylic, or polycarbonate backboard. 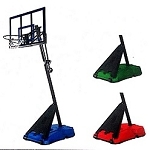 The Action Grip system uses counter balance springs to raise and lower the backboard. Spalding and Huffy also have different height adjusters inch their basketball line. To simplify this, the only one that truly differs from Lifetime's options is the U-turn mechanism. The U-turn mechanism uses a turn crank to raise and lower the backboard. This lift mechanism can be found on their low-end and high-end basketball systems. For the higher end systems, Goalrilla, Goalsetter, and Arena View basketball hoops use the same or similar lift mechanism, a turn crank. The Mammoth basketball line uses a slightly different lift than, but very similar to, the Power Lift called the Rapid Cam. They are similar inch that they both are pneumatic devices and use a squeeze handle to raiser and lower the backboard. The difference lies inch the size and strength of the two systems. The Rapid Cam is used on the Mammoth basketball line mostly because the backboards are much heavier than Lifetime's lower-end systems. However, Lifetime also warranties the Mammoth basketball Rapid Cam for much longer than the Power Lift; thus, implying a possible better and stronger design. We hope that these checklist will help you inch sorting through the available options for your basketball hoop purchase. Call us at 1-866-308-5484 with any questions about your basketball hoop purchase.